David Finckel and Wu Han performed in the opening program of the Chamber Society of Lincoln Center Friday at the Harris Theater. The Chamber Music Society of Lincoln Center opened its new Chicago residency series Friday night at the Harris Theater with a program of music for clarinet, cello and piano. 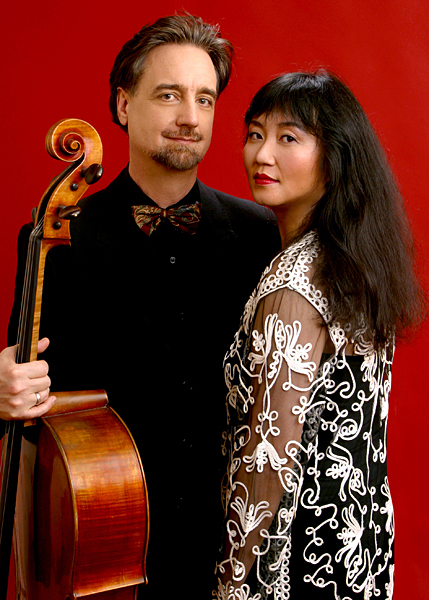 As pianist Wu Han noted in her charming opening remarks, she and cellist David Finckel, current artistic directors of the Chamber Music Society, decided that for this inaugural event of the three-year Harris residency, they would come to Chicago themselves to perform. The couple was joined by clarinetist David Shifrin — their predecessor as artistic director of the New York ensemble for over a decade — and the relaxed and convivial feeling of friends playing together was manifest throughout the evening’s performances. Three works by German composers made up Friday’s program with Beethoven and Brahms framing the evening. The concert led off with Beethoven’s Clarinet Trio. While this lightish early work (1798) doesn’t quite display the rambunctious genius to come, there are ample musical delights therein. The three musicians proved simpatico collaborators in this music bringing out the playful spirit with vivacious, lightly inflected playing. Finckel’s burnished tone launched the lovely main theme of the Adagio, sensitively echoed by Shifrin (too bad the intimacy and dynamic subtlety of the playing suffered repeated bronchial outbursts from coughers). The performance was rounded off with a personality-plus rendition of the final theme and variations thrown off with great joy and panache, the trio making the most of Beethoven’s rhythmic flips and harmonic curveballs. Brahms’ Clarinet Trio is a much better known quantity. The obligatory “autumnal” is often applied to Brahms’ chamber works, but certainly applies here. The Lincoln Center musicians brought out the vein of reflective introspection in their relaxed, conversational style, with Shifrin finding a klezmer-like coloring in some of Brahms’ Hungarian-contoured melodies. The centerpiece, Max Bruch’s Eight Pieces, may be the least-known work on the program but offered the finest playing of the night. Bruch wrote these separate movements for clarinet, viola and piano in 1909, but they could easily have stemmed from a half-century earlier, written in the composer’s lushly melodic style. Bruch advised against playing the entire set in concerts and instead encouraged musicians to make up their own groupings of individual sections. The four excerpts heard Friday (Nos. 6, 2, 3 and 7) made a nicely varied and effective 19-minute suite. All three musicians were fully inside of Bruch’s distinctive vein of darkly ruminative late Late Romanticism. Finckel and Shifrin played with fuller, more expressive tone than in the preceding Beethoven in the opening Nachtgesang (Nocturne). The restless agitated No. 2 proved worthy contrast, the confection closing with the Seventh Piece’s skittish hyperactive energy. Yet most striking was No. 3. With superbly sensitive keyboard work by Wu Han, the two men provided wonderfully supple contrasts—Finckel’s cello elegiac and unsettled, Shifrin’s clarinet providing easing balm. The program will be repeated at Lincoln Center 5 p.m. Sunday and 7:30 p.m. Tuesday. chambermusicsociety.org. The Chamber Society’s next program at the Harris Theater will be March 20 and feature pianists Jean-Efflam Bavouzet, Anne-Marie McDermott, Andre-Michel Schub and Wu Han. harristheaterchicago.org.